Built by Peter Dickinson. Opened 1 Oct 1960 as "O'Keefe Centre for the Performing Arts". Named after a corporate sponsor, O'Keefe Brewing Company. 1996 renamed "Hummingbird Centre" after another corporate sponsor, Hummingbird Communications. 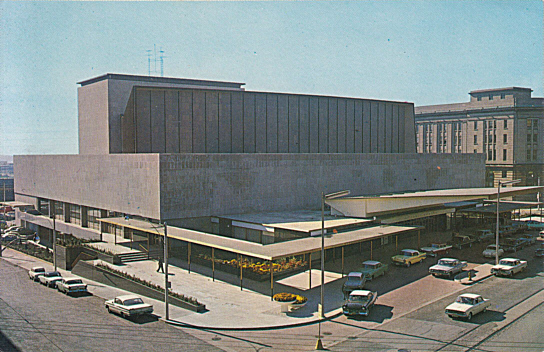 From 1961 until 2006, home to the Canadian Opera Company and the National Ballet of Canada. 2008-2010 renovations. Re-opened 1 Oct 2010 as "Sony Centre of the Performing Arts" after another corporate sponsor. 3191 seats. Reverse Text: "O'Keefe Centre for the Performing arts. Toronto, Ontario, Canada. A multi-purpose theatre desivned to accomodate all of the performing arts." 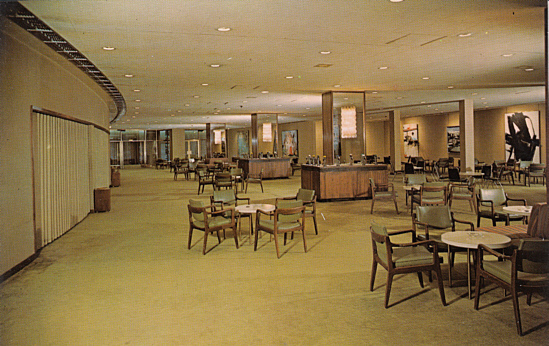 Reverse Text: "View of the lower main lounge and Art Gallery of O'Keefe Centre, one of the many interesting features of Toronto's luxurious, multi-purpose theatre. The lower main lounge is fully licensed and can be used as a restaurant area, for dancing, dining and receptions. Focal point of interest is the art gallery which carries an everychanging display of international works."